Acute Care Floor: We offer 14 beds for patients of all ages to receive care for a diagnosis and treatment for a variety of medical conditions. We provide 24/7 care with RN's, LPN's, and CNA's. Our nursing staff work very closely with our providers to ensure high quality of care for each individual's specific needs. Our goal is to help you reach your optimal health. Swing Bed: We offer a swing bed program for those who are post hospital/surgical that require more assistance including Physical Therapy, Occupational Therapy, and Speech Therapy. We schedule care conferences to discuss our patient's goals, and how we can achieve them in an optimum time frame. Emergency Department: We provide emergency treatment for patients with a life-threatening problem. We are a Trauma ll access center which stabilizes patients requiring to be transferred to another facility by flight or ground transfer to get the appropriate care they need. IV Infusion Therapy: We offer our community the option to receive their IV (intravenous) medications at our facility close to home instead of having to travel to facilities outside of the area. We have a specific room setup to accommodate IV infusions that provides our patients a home-like environment. Inpatient Pharmacy: A pharmacy is located within the hospital so patients can receive medications in a timely manner. Our board-certified Pharmacist will work with patients and families to find affordable and effective medication. At South Lincoln Medical Center, we have an on-site case manager who works with your insurance to authorize any stays within the facility. Upon patient authorization, the Case Manager will continuously update your insurance company, and work with you on a discharge plan. 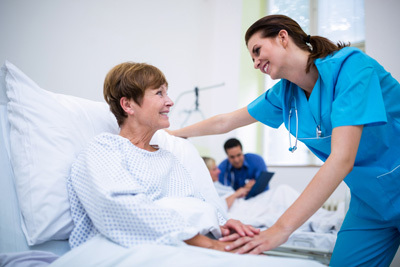 Our Case Manager also works with the patient and their family to set up home health, hospice, oxygen, and medical equipment needs prior to the patient being discharged.